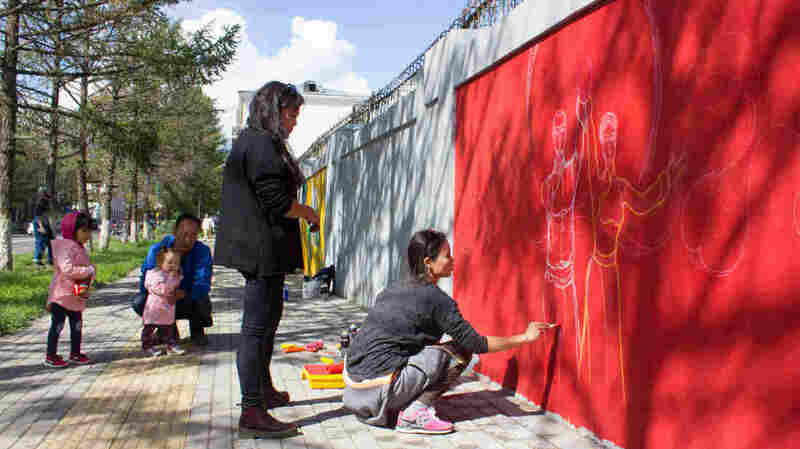 Mongolia's Hunt For Female Street Artists : Goats and Soda The goal was to paint street murals that illustrate the 17 U.N. Sustainable Development Goals. And not to have only male artists — especially for the goal about gender equality. They're the only two female artists working on a Mongolian street mural about the U.N. Sustainable Development Goals: Michid Enkhbat (stooping) and Odno Bold. The goal they're illustrating: "gender equality." Odno Bold extends her hand in greeting, than pulls it away quickly. For a moment she has forgotten that her hands are covered in pink chalk and red paint, a hazard of the trade. Bold, who is 24, is outlining her first street mural on the wall surrounding the United Nations compound in Ulaanbaatar, Mongolia. Dressed in black leggings and boots, Bold and her artistic partner on the piece, Michid Enkhbat, 25, are the sole women working on the wall. Like in many other countries, men mostly do street art here. "Women are not brave enough to do graffiti," says Bold. She knows only a few female street artists in the country, including Enkhbat, who has already done two murals in the city. Enkhbat's first piece depicted a day in Mongolia and was done in Sansar Tunnel, an underground walkway in the city featuring street art. Bold's first street art project is the current commission by the U.N. to help decorate the wall with the 17 Sustainable Development Goals. The goals, which include objectives such as ending poverty and hunger, were adopted in 2015 to guide global development. Mariyam Nawaz, communications officer for U.N. Mongolia, felt having Mongolian artists illustrate the goals was a great way to highlight them. It also added beauty to a cracked and dull gray wall. Nawaz wanted both female and male artists to work on the project but struggled to find women. Nawaz turned to U.N. intern Urandulguun Enkhbat, who also had trouble locating female street artists. Finally she suggested her friend, Bold, who in turn recruited Michid Enkhbat (no relation). By the time the pair was brought on board, there were only five goals left to illustrate. Bold chose gender equality. "I think it is very symbolic if a girl is doing it," says Nawaz. On the last day of work this August, Bold and Enkhbat sketched a man and a woman dressed in traditional Mongolian clothes holding up a light in triumph. Floating around the pair was a hadag, a sacred silk cloth that among other things represents balance. The triumphant image placed on a bold red background was inspired in part by socialist art the women remember from their childhood. "I wanted to interpret male and female as equal," says Bold. "Because in socialist times everyone had equal rights." It is a nostalgic sentiment that United Nations Population Fund Mongolia representative Naomi Kitahara is familiar with and which she says rings true. "When we look at gender equality indicators, former socialist states perform very well," says Kitahara. Currently, Kitahara says Mongolia has two parallel systems: one modern and urban, the other nomadic and traditional. As a result, the country as a whole is at the midpoint in achieving gender equality. Enkhbat believes it is a goal that men and women need to work on together; that is why the pair in the image holds the light up together. As Bold and Enkhbat work, the artist Tugi, who like many Mongolians uses only one name, looks on. Tugi is working on the goal of economic growth and productive employment. He has known Bold for years and admires her work. Bold's paintings use bright colors and feature traditionally dressed Mongolians interacting with the contemporary world — a woman holding a cell phone or a man uttering the word "pizza" written in a word balloon. The images translate well to street art, a form Bold has long wanted to try but until now was scared to take on because she did not know how to use spray paint. "Men just experiment with it and then learn," she says. "Because I didn't have education to use it properly I was scared to use it." Enkhbat points out that because women are often physically shorter than men, it is harder for them to reach higher spots on the wall. Pedestrians passing by don't seem to care that the artists are women — they just appreciate the transformation. A man and two little girls stop to watch. A pair of elderly men asks Bold if she is a student. Nawaz brings pizza and cokes. It is Thursday and the U.N. Mongolia communications officer says families who came on Sunday are now returning. "They said 'we want to see how it's actually progressing'," says Nawaz. Bold enjoys the audience and considers the work a sort of performance art. None of the artists are being paid, but Bold is happy with the opportunity to experiment with a new art form. Next she hopes to do a project in the city's ger areas, unplanned sections on the outskirts of the city where people have set down their gers or yurts. The ger areas often lack amenities and are considered less desirable neighborhoods by some of those who live in the city center. Other artists have worked in the areas; she'd like to create street art. She believes if people see bad things they will do bad things, but if they see good things they will do good things. "An artist has the responsibility to make the environment into a better place so that people can look at it and become better people," she says. Like the sustainable goals, it is a noble objective.